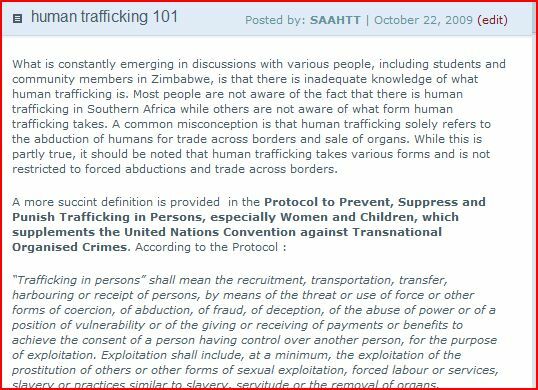 human trafficking | Stop Human Trafficking in Southern Africa! Late last year, we (SAAHTT) applied to the Echoing Green Fellowship. This is one of the best international fellowship programmes for social entrepreneurs. The program is for non profit and for profit interventions that are aimed at addressing the world’s social needs. It is a fellowship for ‘world changers’. It is also one of the most competitive fellowship programmes around. We applied to be part of the Echoing Green fellowship last year (2009). We were motivated by the opportunity because it would present us with relationships, mentorship and equally important seed capital. The money would have been a welcome boost for the organisation as it would have meant that we would be able to initiate and upscale projects to combat modern day slavery. While the fellowship is open to both non profit and for-profit ventures it is often regarded as a purely social entrepreneurship programme. We still applied to the programme with full knowledge to this because while we are a non profit project, we believe in the ethos of social entrepreneurship and sustainability. 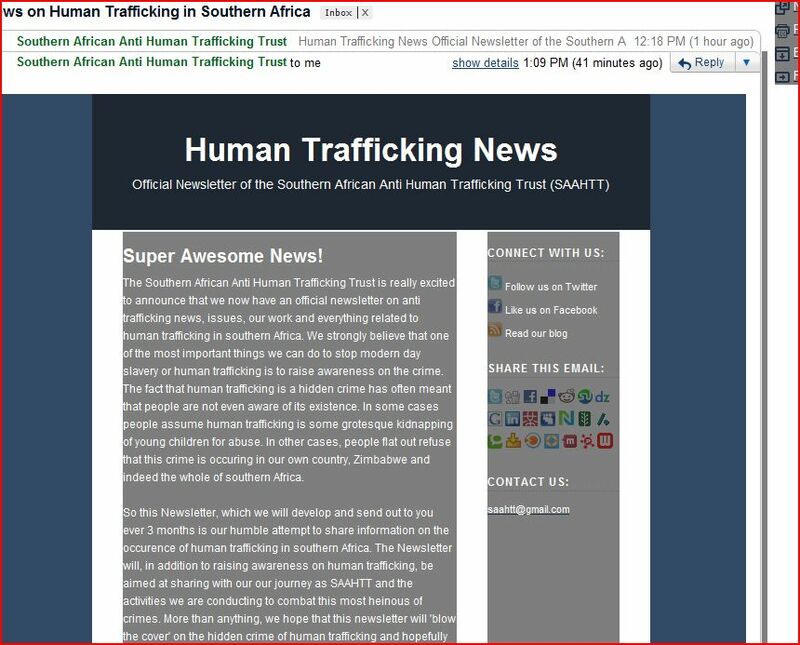 We believe that every dollar SAAHTT gets should be optimally used to counter human trafficking in Southern Africa. We believe in efficiency and in being excellent in every activity we undertake. We believe in communicating well with all our stakeholders and we hate window dressing. These are things that are missing in non profits globally. We hope to buck the trend in our own little way. But that is just an aside. The real story is we went on to put our all behind the application. The application is so taxing because it demands you to think through your project idea. Echoing Green fellows are people with projects still in the start up phase and often this means people who are still pivoting and developing their ideas. In addition, the application requires a certain level of brevity that is so demanding. Explaining everything in 500-1000 word limits is difficult. Want to know how that can be-imagine having to explain everything about your project in Twitter characters (140 characters). But we managed to go through the first round. We were one of only 350 projects that went through to the second phase, out of the initial 1100 that had applied. The invitation to complete the second phase application was a congratulatory email notifying SAAHTT that we constituted 30% of organisations that had passed the first phase. We were really overjoyed at the SAAHTT offices. This was validation of our project idea. It meant so much to us as the SAAHTT project idea implementation was only 2-3 months old. We, however, remained tempered by the fact that the process was not complete and was even more difficult through the second phase. We managed to get through the second phase application and submitted. Then we……waited…….and……waited…….and ……..waited. The process itself was not as long as the last sentence seems to portray. It was just two months of waiting. But still, it was such a nail biting wait and a tad bit stressful. And then the dreaded results came in. The regret email was so crushing. Here at SAAHTT we do not take disappointment as easily as we would like. We were so disappointed and pretty much preferred not to talk about it. And then another e-mail came. It was the feedback to our application. Now this e-mail is not to detail how disappointed we were by failing to get the fellowship. This post is instead an unashamed thumbs up to the Echoing Green programme and more importantly in our personal experience, the application process. The application process allowed us to introspect. To think about what exactly it is SAAHTT intends to do and why it is going about it in one way and not the other. It allowed us to think ahead and really envision the project. It allowed us to discover new insight into the problem of human trafficking in southern Africa. And to boot, we got an outsider’s view of SAAHTT. A professional evaluation of our ideas and strategies. You just do not get that kind of feedback from other programmes. Granted, fundraising is brutal. But we sure did enjoy the process of applying for the Echoing Green Fellowship despite the rollercoaster of emotions 🙂 So what happened since then. Well, we regrouped, doubled up and hunkered down. We continue to incrementally address no less one of the biggest and daunting challenges of our time-human trafficking/modern day slavery.